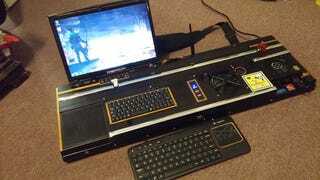 This custom PC is too small to be a desktop, but too big for a laptop. It’s a unique portable build, something out of an 80s cyberpunk world. And that’s what actually inspired its builder Chimerus: portable cyberdecks from Shadowrun. Looks like a busted replica at first, but even though the build is based on a gutted Casio keyboard, it’s actually working and its creator planned out everything. He has a really neat step-by-step work log with WIP pics (via Tumblr) over here. I wanted to be able to run a dedicated graphics card, which greatly added to the size of the machine. Also, decided on mounting a stap to sling over the back instead of a carry handle, for mobility. Minimum laptop size display for usability, also could recycle outdated laptop. Finally, so that it can double as a tv pc, mounted a detachable wireless keyboard/trackpad combo for remote control. Used a busted keyboard from ebay as the main body for structural integrity. Bonus - metal back provides strength, and since its screwed on, would be able to easily replacement/upgrade. Here’s concept art of Shadowrun Returns showing a Troll Decker with an original Cyberdeck.